Which team provided the biggest underdog moment in NCAA history? 2013 Florida Gulf Coast? 1983 NC State? 1996 Princeton? Degree Men deodorant launched “Clash of the Underdogs,” a series of brackets that place history’s favorite March Madness underdog victories against each other, and gives fans the chance to vote for the greatest of all time. Fans can visit www.DegreeBasketball.com and vote for their favorite NCAA March Madness “underdog moments,” and then register for the chance to win a trip to the 2015 NCAA Final Four in Indianapolis. 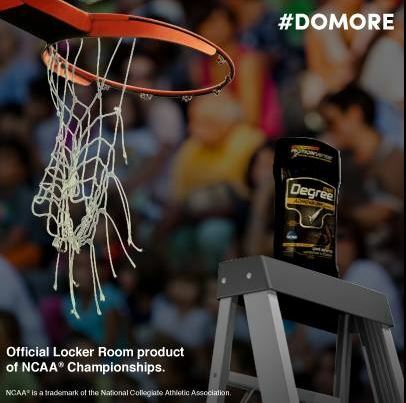 As the Official Locker Room Products of NCAA Championships, Degree Men wants to make sure that you are set for the March Madness frenzy and stay ahead of sweat and odor during those buzzer-beating moments. Try out the Degree Men limited edition NCAA basketball-themed Sport Defense stick which has new and improved MOTIONSENSE™ Technology. It’s the only antiperspirant/deodorant that releases extra microcapsules when you start to move – not just when you start to sweat – protecting you from sweat and odor for 48 hours and allowing you to DO:MORE. The more you move, the more it protects. For more information on Degree Men, visit the website, the Facebook page and the Twitter.com page. Fans can view the short film series on Stephen Curry on YouTube by clicking here. Scores Report tackles Tough Mudder Lake Tahoe Degree DO:MORE Style!